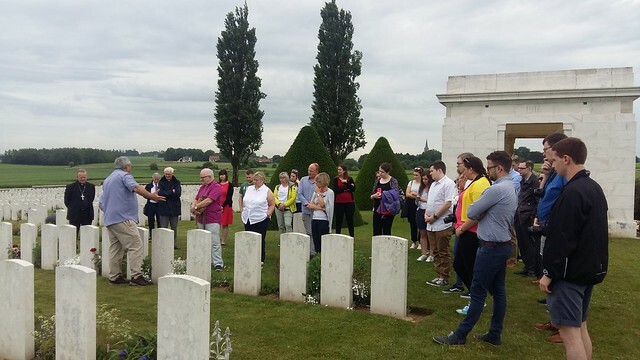 A pilgrimage of hope to historic and poignant sites relating to the First World War, led by the two Archbishops of Armagh, has commenced with visits to the city of Kortrijk, in Belgium, and Guillemont Cemetery, in France. A visit to Kortrijk, Belgium, as part of the cross-community pilgrimage of hope. The delegation visited Kortrijk, which was heavily bombed in 1917, yesterday afternoon and arrived at Guillemont this morning. The cemetery is the resting place for many soldiers from the 16th Irish Division who fought at the Battle of the Somme. This was followed by a visit to the Ulster Tower – a memorial to the men of the 36th (Ulster) Division which suffered very heavy losses on 1st July 1916, the first day of the Battle of the Somme. The delegation then travelled to the nearby Thiepval Memorial and the Y Ravine Cemetery. The pilgrims pictured at the Ulster Tower. The group of pilgrims comprises 36 people of varying ages and backgrounds and representing the Protestant and Catholic traditions, including a core group of 16 young adults, who in visiting the war sites and memorials will be able to forge friendships and share their thoughts and hopes for the future while exploring their cultural identities. Archbishop Richard Clarke (Church of Ireland) and Archbishop Eamon Martin (Catholic Church) previously led a cross–community delegation of young people from across the island of Ireland to the battle sites of the Somme two years ago; the current pilgrimage marks the upcoming centenary of the end of the First World War. Armagh City, Banbridge and Craigavon Borough Council has provided generous financial support to enable the group of young people to journey with the Archbishops on this pilgrimage.